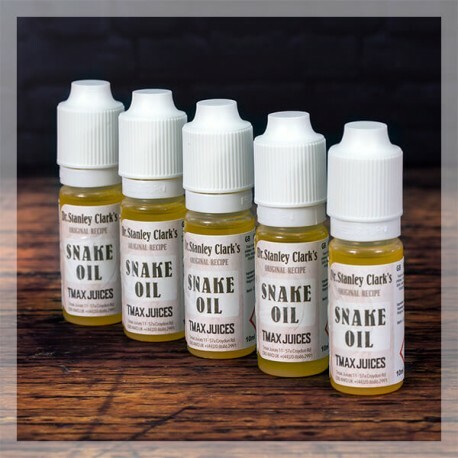 Snake Oil e-liquid by T-Max - 5 x 10 ml bottles. An e-liquid that will awaken your senses with its complex mix of citrus fruits with a touch of liquorice-aniseed. Snake Oil will surprise you with its freshness. To taste today! Snake Oil e-liquids are special as they are steeped for 14 days for perfect aroma maturation. Snake Oil e-liquid is compatible with all brands and models of electronic cigarette, cigar and pipe. For optimal preservation of flavours, keep your Snake Oil e-liquid away from the light, in a dry place and at an ambient temperature of around 20°C. j'adore ce liquide du Docteur Stanley Clark's même en 0MG. Parfait comme all-day, je ne m'en lasse pas.